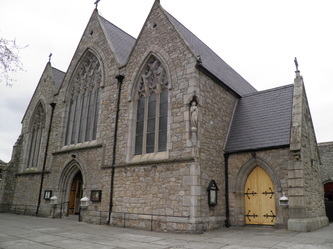 On Sunday 5th May, Andrew O’Connell, Parish Priest, convened a parish meeting in the chapel in Irishtown which, he pointed out, had served the people for three hundred years. The time had come to replace it. A committee, whose secretaries were Michael Murphy and William Reilly, was formed to assist with planning and fundraising. Well-known architect, James J. MacCarthy, prominent in the design of many distinguished churches following Catholic Emancipation and a disciple of Augustin Pugin who promoted the Gothic Revival in the 19th century, furnished the design for a church in Dublin granite. The site provided by the landlord, the Right Honourable Sydney Herbert, would command a fine view of Dublin Bay. MacCarthy favoured the “Middle Pointed Style” as representing Gothic at its best. His basic plan for Star of the Sea church was of a nave with two side aisles and a main entrance in the West gable, facing the road. (The side porches were not added until 1883). On 7th May Archbishop Daniel Murray laid the first stone. The sign of the cross was cut into each of its surfaces. Its upper side contained a cavity in which memorabilia were inserted. These included Victorian coinage and a copy of the Freeman’s Journal. A major setback occurred on Christmas Day and on 27th December when violent storms toppled the front and rear gable walls of the uncompleted building. The church was dedicated by Archbishop Cullen on 15th August, but took some years to complete. The North transept (on the left as you face the altar) held the sacristy until a new one was built on the East end. The South transept is a relatively recent addition. Other features of the church are the pointed nave arcade with plain moulding resting on granite pillars and the roof with exposed timbers resting on granite corbels. There is no clerestory as the aisles are almost as high as the nave with proportionately tall windows. The outer walls are granite with rubble filling and smooth plaster interiors. 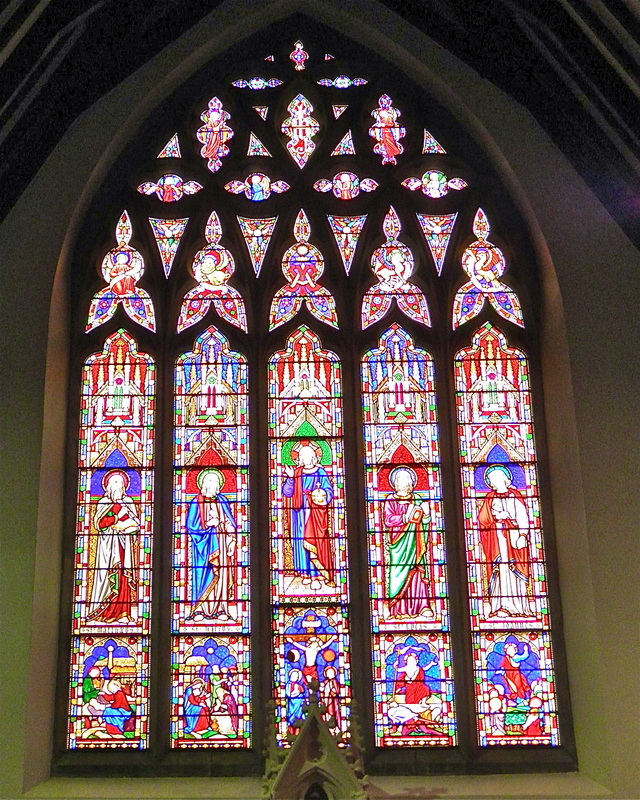 The most striking of many fine stained glass windows is the large East window showing the Four Evangelists. 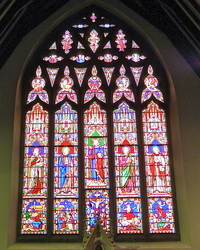 The family memorial window above the altar of the Virgin Mary is the gift of Mrs. Eliza Morris. Sandymount, or Irishtown, became a separate parish under the guidance of one of the curates,Thomas Leahy, its first parish priest without other territorial commitments. Thomas Leahy died in May. Parishioners decided to erect in his memory a pulpit and altar rails. The present ambo is comprised of marble from the original pulpit and encases the tablet which honours him. John O’Hanlon, later Canon, was installed in June as parish priest. Well known as a history scholar, he continued work on his magnum opus. LIVES OF THE IRISH SAINTS. Nine volumes were published before he died. On both sides of the church stained glass windows in honour of Irish saints are a reminder of his enthusiasm. 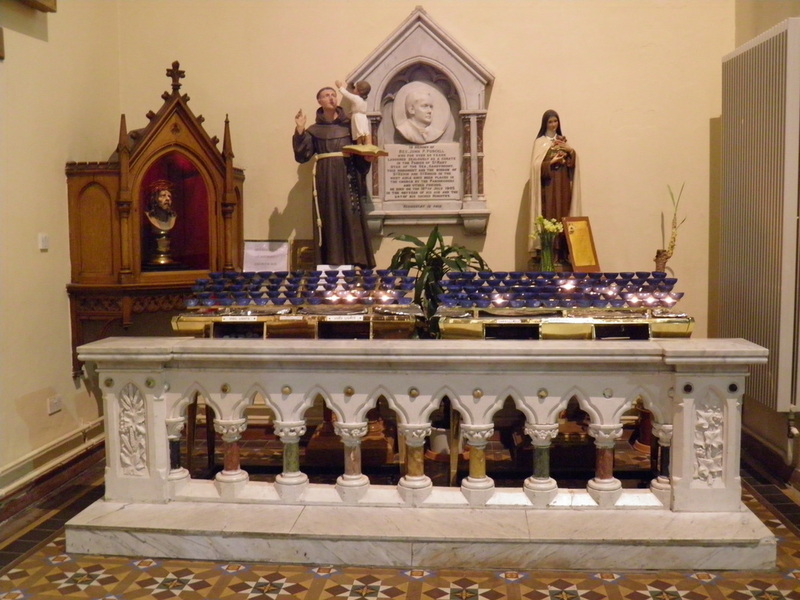 In August the parish celebrated the centenary of the opening of the church. Dr. Richard McNevin became parish priest. At one time professor of History and Music in Clonliffe College, he was a founder member of Our Lady’s Choral Society. Structural work carried out in the church during his pastorate included the addition of galleries and sacristy rooms. The seventeenth century painting, THE RETURN FROM EGYPT, was restored by Stella Harte, re-sited next to the 13th Station of the Cross, and blessed by Pearse Walsh C.C. 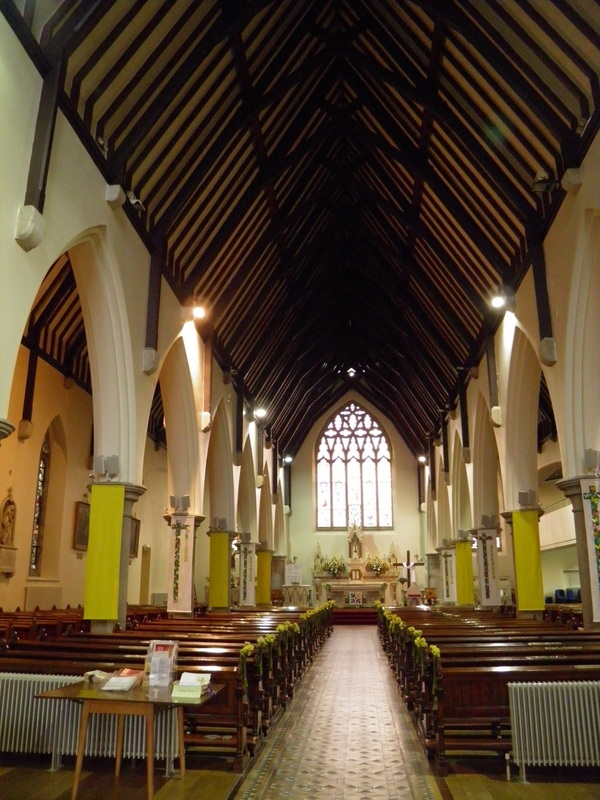 Refurbishment plans included roof restoration, painting, repairs, installation of a proper heating system, replacement of the sacristy in the North transept, redesign of the existing sacristy area to provide meeting rooms, and addition of a small extension to provide a parish office.